Sounds like the children had loads of fun! Reminds me of how much fun I had with my own, just didn't stay a child long enough! I love the scene you created for taking photos of all the superheroes. Love the rock-climbing idea. A safe way to let them do something a little scary. That would have been so fun to do when I was little but of course we didn't have such things. I am really ignorant on super heroes as we have a daughter and strangely all the kids her age in our surrounding area are girls, no boys. Your boys are still talking about that party whenever I babysit! Last time I picked the twins up from preschool, they were BOTH Max Steele. I got to drive back to your house with two Max's in carseats in the back. 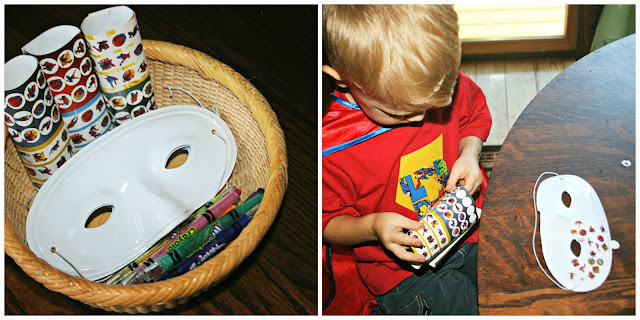 :-) You are so creative with party ideas. Bet nobody else has even gotten to "fly" at a superhero party. What fun! JDaniel would love to have flown! Who doesn't love a super hero! I miss planning children's parties. My babies are all growing up on me! Oh my gosh, I have never heard of this cartoon or these figures, so you just helped me out with Christmas... and the boys looked like they were having a blast! VERY cute! We've done lots of superhero themed parties over the years...in fact, my boys still like to play dress up! You have got to be the coolest mom on the block. What a great idea for boys. And it doesn't sound like it was too expensive. Wow! How fun is this? :). It's great that your boys love the action figures so much, and that teamwork is an emphasis. HOW do you think of all these cool things? This must be the best boy party ever! No, I never heard of Steel, will it also be a cartoon? As for myself, I would have spent the whole time at the craft table, what a tempting array of stickers and masks. That was a lot of fun - I remember those days and kind of miss them. 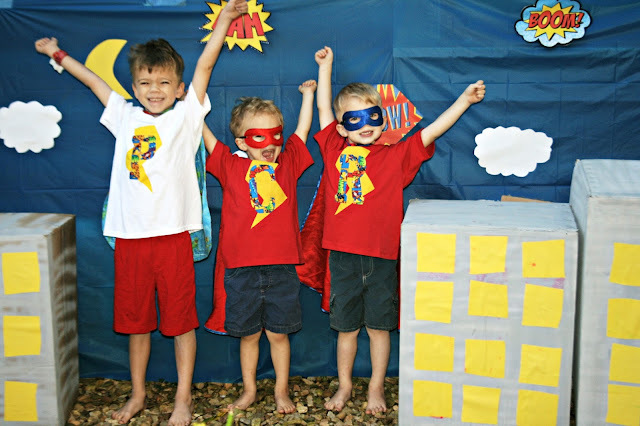 Perfect party idea for those little superheroes. Love the "flying" exercise. Fun! Oh I am way behind in my superhero knowledge. Thanks for the info. You put so much thought and work into this. You are an awesome mom. I never heard of Max Steele but it looks like the boys had a great time. I don't see how you work and still devote so much time to your kids. When mine were little, my wife stayed home and I worked two jobs. Now I guess about all mothers have to work and take care of the kids too. Looks like a fun party, what boy wouldn't enjoy that!!! I love these photos of all the fun! You are the super cool MOM... letting your kids have a Super Hero party!!! Looks like they had a great time. The boys are so cute and look like they are having such a great time! Looks like fun! And when they are adults, these pictures will delight their friends. All the personalized details! So fun! 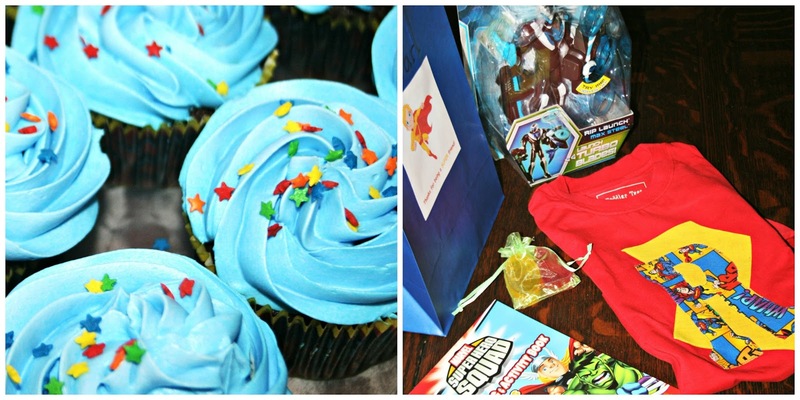 Awesome a superhero party! The boys must have had a super time. 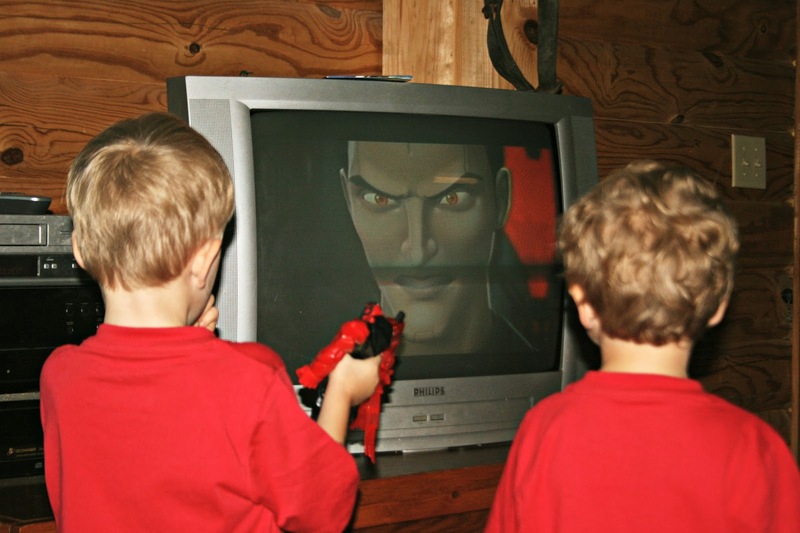 I bet my grandsons would be interested in Max Steel.